Distillation is one of the surest ways to have clean water for home use. There are no added chemicals and it effectively gets rid of water pollutants including disease-causing micro-organisms. Distillation is a process that occurs naturally on our planet and has been simulated in a machine. A water distiller purifies water by boiling it to its evaporation point, separating water from impurities such as chemicals, minerals, and dissolved solids. Here is an in-depth look on how this actually works. A water distiller can either be connected directly to your water supply, or you have to manually fill the machine with water. Either way the same working mechanism applies. Distillation starts with a heating element that boils water into steam. Steam has a higher boiling point than almost all water contaminants that are separated from the water as it evaporates. Steam is then directed to another chamber and cooled through condensation for clean, purified water. Distillation is one of the most effective ways to purify water of harmful chemical substances. Distilled water usually has a pH of 7 but reacts with carbon dioxide and becomes slightly acidic with a 5.8 pH. Water distillers with a carbon filter can help alkalinize the water after distillation. Who Will Need A Water Distiller? Water distillers are recommended wherever you need highly purified water. They are most beneficial when you need water that does not have any hard minerals. Domestically, it is good for watering plants and filling aquariums since you can control what minerals are present in the water. Machines that use a heat element and water for example, a steam iron or humidifier also require distilled water that will not clog up moving parts with mineral deposits. Distilled water is also great for drinking but lacks health minerals that are good for you. Commercially, water distillers are used in cooling systems as it does not leave any mineral deposits on metallic surfaces, improving durability and efficiency. Whether you are a new or experienced buyer, a good water distiller will serve you for years and work efficiently to constantly produce clean and pure water. We have identified the best water distillers available based on budget and features. This will help you pick a distiller that is high quality and made to serve your needs. There are two main types of home-use water distiller; manual and automatic. The manual one requires you to fill it with water while an automatic water distiller connects directly to your water supply. Homes require simple basic units that are easy to use and cheaper to maintain. H2o Labs is a leading brand in the market with reliable and easy to use water distillers. It is made of high-quality material that is certified to produce very clean water compared to other brands in the market. To purify water, this unit uses activated carbon pods that removes organic compounds such as chlorine. They are made to last three times longer than regular filters and can last a year before you need to replace it. We love the H2o Labs water distiller because it is made with quality assured parts. The interior is made from food grade stainless-steel housing and all plastic parts are BPA free. Distilled water is dispensed through a porcelain nozzle so it does not come into contact with the metal or plastic. It comes with a stainless-steel heating coil that is just the right size. The 565W heating element is considerably small but works as fast and better than larger heating elements that consume more power. It has an easy to use on/off automatic switch that cuts of water once it distills 1-liter cycle. It can complete 4 cycles in 24 hours, enough to supply the average household with enough drinking water. The glass carafe is made of high-quality glass with an easy handle, large openings and easy to remove lids. It makes cleaning easier as you can easily reach hard to clean spots. MegaHome presents a world-class solution in their countertop water distiller. It is a small, compact machine made to fit just about anywhere and has beautiful design that resembles a coffee pot. Customer satisfaction is guaranteed by the MegaHome UL certifications. This means that it is a safe appliance to use and was made with safety measures and stringent conditions to guarantee a great quality product. Water is distilled at 212°F to remove contaminants left behind once all the steam has evaporated. If you live in an area where water is contaminated by VOCs, there is the option to add activated carbon filters. The filter gets rid of bad odors in water and improves taste. You are recommended to change your filters after 30 gallons of use. The MegaHome water distiller ensures your water remains pure by the time you dispense it. It is made of stainless-steel housing, a glass carafe and a porcelain nozzle that keeps water free from plastic or metal contact. With 22 years’ experience in their pocket, MegaHome delivers on reliable customer service and offer a 1-year warranty on the stainless-steel countertop water distiller. The Waterwise 3200 water distiller stands out on the list because it is larger in size thanks to a design that has two carafes. The secondary carafe is detachable, making it portable and can easily be placed in the refrigerator. It is attached to the water distiller unit by a docking station as it collects water from condensing tank. It can produce up to six gallons of water a day, with an average flow rate of a gallon every 4 hours. There is an automatic shut-off feature that ensures water does not drip-off and make a mess. It is an 800W water distiller made to fit a regular power outlet and has a slick stainless-steel finish. In addition to distillation, there is a carbon filtration stage that ensures your water is free of pollutants. These two processes combined eliminate just about every contaminant in your water and provide the highest purity water for drinking and use. The Waterwise 3200 water distiller is easy to maintain. The filter cartridges are replaceable and can last up to two months. Pure Water Mini-Classic CT distiller is an affordable option for domestic use. It has a compact design that easily fits in tight spaces but performs like a work horse. It provides highly purified water that is suitable for cooking and drinking. It does not require any installation. It is portable and ideal for renters, travelling and outdoor activities where you do not have direct access to clean water. The Mini Classic CT water distiller purifies 8 gallons of water a day with a 3-hour long cycle. Water contaminants are eliminated by using distillation and carbon filtration. It has an automatic on and off switch and a safety feature to turn shut down the machine in case of overheating. This unit has been constructed with great workmanship that runs smoothly with no humming noise. The water jug is made of glass, a safe material that does not trickle harmful contaminants into your water like plastic. Literally nothing can stop you from easy access to clean water as long as you have the Waterwise 1600 water distiller. It is a non-electric water distiller with no moving parts so all you need is to set it up wherever you are and it is ready for use. It performs just as well as electric distillers and can provide up to 16 gallons of water a day. This is enough water to serve a large family or group of people. The high-quality plastic water bottle that collects water is sold separately. This makes it a cheaper option in case you are on a low budget and looking to save some money by using your own reservoir bottle. The Waterwise 1600 water distiller is light and easy to use. It has two integrated parts that come preassembled and only weighs 9 pounds, a handy feature when using this outdoors or during an emergency blackout. Waterwise 1600 is made of stainless-steel housing and heat-resistant tubing that lasts long. To distill water, simply place on a direct heat source for example, a hotplate, wood source or any electric burner. It has a digital timer so you can monitor your water and a 2-year warranty so you can enjoy the Waterwise 1600 distiller with ease of mind. Hiking and other survival outdoor activities often means that you do not have access to a clean and safe water source. There are water distiller units that are good for remote places and do not require any electricity to function. They are lightweight and can distill all kinds of water including sea water. To be cut off from a clean and pure water supply is not only an inconvenience but also a risk to your health. Several water contaminants are found in our water, especially when it is tapped directly from the source. During most natural disasters, municipal water supplies are exposed to the elements and is unsafe for human consumption. The SHTFandGO D-STIL water distiller is perfect for such situations. It is a Do-It-yourself emergency water distiller that is non-electric and can use any heat stove; electric, wooden, or a charcoal grill. It is energy efficient but performs just as well as other electric distillers, for example the GRAVI-STIL water distillers carried by the same brand. For the boiling and condensing pots, you can use your own pots, making it retail at one of lowest rates you can find. The SHTFandGO D-STIL water distiller fits a boiler top ranging from 8” to 12” while the condensing pot can be of 10” in diameter or more. Water is distilled and filtered through gravity so it is free of 99% contaminants such as bacteria and heavy metals. It can also distill sea water and has a capacity of 8 to 10 cups of water per hour, a sufficient capacity for a family of four. This unit is built to survive harsh conditions with solid, durable stainless-steel housing and heat-resistant hose and gaskets made from food-grade silicone tubing. Commercial distillers range from whole house systems to complex and larger distiller machines with a gallon capacity of 75 million per day. Whole house water distillers are installed into the plumbing system already in your home. It is a cost-effective and reliable way to ensure a constant supply of distilled water though it requires regular maintenance to prevent lime scale build up. 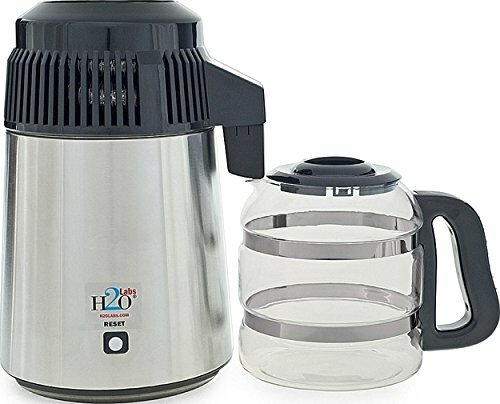 For situations where a countertop water distiller is too small, for example, in a large family, the Durastill 12-gallon distiller is a good option. It is a commercial grade water distiller that connects directly to your plumbing system for continuous supply of purified, distilled water. It is recommended when using distilled water in large scale since it can produce large volumes of water per day. It has a well-made heating element and a fan-cooled condensing coil that perform excellently and provide safe and distilled water. The Durastill 12-gallon water distiller automatically switches on and off once its reserve tank is full so you do not have to personally monitor it. You can either store the distilled water in your own tank or buy the 10-gallon reserve tank that comes with this unit. Durastill water distiller is made of 316 alloy stainless steel which is safe and durable-. It comes inclusive of an installation kit with hardware made to fit most standard sized faucet systems. Waterwise 9000 combines water distillation and carbon filtration to purify water. It effectively removes water pollutants by separating steam from toxins such as bacteria and dissolved solids. The carbon filter absorbs bad odor and makes water alkaline before it is stored in the polycarbonate collection bottle. The Waterwise 9000 distiller is a 750W purifier that requires no set-up and can produce up to 5 gallons of distilled water at home. The boiling tank is detachable, a feature that makes it easy to fill up the sink and convenient to clean. It has a small footprint and is portable. To use, simply use a push-button that will automatically shut off water after a 1-gallon cycle. The Waterwise 9000’s built-in thermostat prevents overheating and saves energy by starting the fan twenty minutes after its turned on. Water filtration is a wide topic that can easily get overwhelming to digest. To help you along, here are tips on how we chose the above water distillers so you can find one that suits your situation. There is no one size fits all solution but preference will vary according to need and budget. This is a measure of how much your water distiller can hold at once before you need a refill. The capacity of your distiller should match your water demands depending on how many people use it. The capacity of your water distiller will influence the size and style of your unit. Large capacity units generally take up more space and may not fit in your kitchen. They have an undesirable industrial finish that is better fitted in a basement and are generally noisy. Small countertop water distillers need to be refilled but produce less heat while in use. They are generally cheaper and are designed to match modern kitchen décor. Distillation is generally a slow process unless when done on an industrial scale. The fastest filter rate of water distillers available is 2 and a half hours with other units taking double the time. This consideration is only important for large families that will require a constant flow of purified water. There are units that have a carbon filtration stage after distillation. Though this may considerably reduce your flow rate, it will improve the taste of water by adding alkalinity. This is probably the most important feature to consider when buying a water distiller. Distillers come with a heat element which requires material that can withstand high temperatures. Stainless steel is the most highly recommended material because it can get hot but does not leach any toxins to your water, unlike plastic. Stainless steel is durable under high temperatures though it is more costly. Glass jars and non-plastic components for example the carafe and nozzle respectively, ensure water stays pure without contact with metal or plastic. Water distillers require regular cleaning to avoid mineral deposits settling in your unit. Ensure you find one that is easy to clean and has large openings so you can get to all the little nooks and crannies. All replaceable parts on a water distiller will also need regular maintenance especially if it comes with carbon filters. Ensure you can easily access replacement water filter cartridges if need be and also factor in the maintenance cost in your budget. Water distillers are heavy-weight machines that work for long hours at a time and require professional expertise to run in case it breaks down. Look out for one with a warranty that is as long as possible so you do not have to incur recent maintenance costs. Whether you are a geek looking to have pure water for science experiments or need it for your aquarium, distillers are effective for having clean water around the home. Installing a water distiller in your home is cost-efficient and will pay for itself after long years of use. Distilled water is free of all minerals which can affect the taste of water and reduces its health benefits. For maximum functionality, remineralize your distilled water with healthy compounds such as calcium if it is intended for drinking.